Richard Paige — I almost felt sorry this morning for the lucky Phi Kappa Psi member bundled up in a winter coat and hunched over the Monon Bell, ringing it constantly from the front porch. Here at Wabash tradition defeats almost everything, including early winter’s chill. Sometimes in sports the significance of the game is lost on fans, while the significance of the result escapes the players. Not here. It was reassuring to hear a pair of Little Giant seniors speak knowingly about the big-picture impact of Saturday’s 38-21 win. It wasn’t about the senior class finishing 4-0 or extending the win streak over DePauw to five. It was about everyone else who holds this place dear. Burk then relayed a story about the aftermath of the 2010’s 47-0 win, where over the Christmas Break, he was back home in Greenfield, Ind., walking through the mall wearing a Wabash t-shirt. An alum approached him, asked if he played football and shook his hand in congratulations. 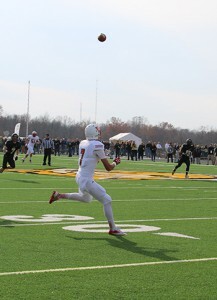 Jon Laird’s 64-yard touchdown reception is pictured here. It was the second-longest catch of his career. Photo by Howard Hewitt. 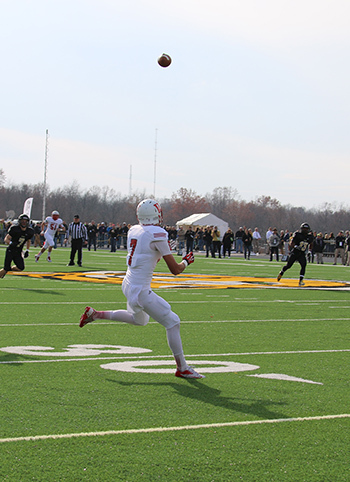 Similar feelings were expressed by wide receiver Jon Laird, whose 64-yard catch and run for a score broke things open in the first quarter. He had received messages of support all week leading up to his stellar performance. “This game means so much to the alumni and the fans,” Laird said. “I’ve received calls and texts the whole week from alumni this week saying ‘go get ‘em.’” The environment here was great. There is no better way to end the regular season than to retain the Bell. “It was so special,” he concluded. That certainly rings true. Especially to the Phi Psis this morning. Steve Charles—I was photographing the Wabash Chamber Orchestra’s final rehearsal of Dvorak’s “New World” Symphony for its fall concert last Sunday night when a familiar string of notes played with unfamiliar beauty stopped me in my tracks. Deborah Woods plays the second movement of Dvorak’s “New World Symphony” during rehearsal for last Sunday night’s Wabash Chamber Orchestra Fall Concert. I’d forgotten that the solo in the symphony’s second movement, one of the most compelling and recognizable tunes in music (think “Going Home”), is played on English horn. I’d forgotten how powerfully that instrument conveys both yearning and hope. And I’d forgotten what a gifted and accomplished musician that soloist—former senior administrative assistant to President White and now Wabash grants coordinator Deborah Woods—is. Even in the flurry of a rushed final rehearsal, Deb played Dvorak’s melody with such precision and power that I felt as though I could have been in any professional symphony hall in the country. And she has played in a few. She completed her undergrad work at a music conservatory, earned her master’s in music performance at Northwestern. She taught oboe for 17 years at Susquehanna University in Pennsylvania. Before she wrote grants for Wabash, she was associate director of development for grants for the Columbus Symphony in Ohio. 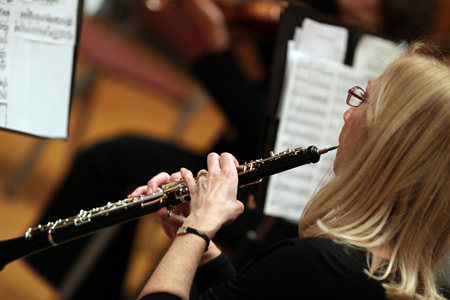 Those who have worked with Deb in the president’s office or in advancement may not have realized she is a professional musician, that she teaches oboe and English horn here, or that she could hold an audience spellbound Sunday night with her playing. The vocation of a musician and teacher in our culture has many facets, but it’s all one gem. Showing how they all fit together in a way that enriches her life and our community is another way Deb Woods teaches students, and all of us, about the power of music. Somehow it’s all connected. And there are several such folks, a story behind every instrument, in this orchestra, which Peter calls one of the College’s best-kept secrets (though the nearly full house at Sunday night’s concert suggests the secret is getting out.) You can start with the director. And those players include a new freshman concertmaster, his brother on viola, and three new student double bass players. With the support of new and continuing excellent players from the Crawfordsville community (this orchestra has long been a remarkable partnership), the group just keeps getting better. Take a look at the photos from that Sunday afternoon rehearsal in this album. Better yet, mark your calendar now for April 21st and the Orchestra’s spring concert. 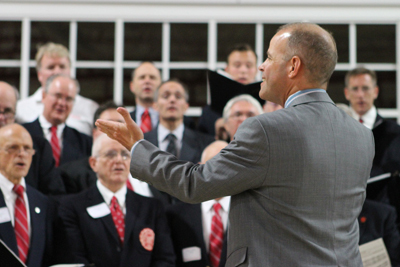 Eric Stark ’88 conducts the Wabash College Alumni Glee Club during Homecoming 2012. Steve Charles—Indianapolis Symphonic Choir Artistic Director and Butler University Professor of Music Eric Stark ’88 writes about his return to the Wabash campus for Homecoming and the Glee Club Reunion in an entry in his “Indy Sings” blog. Wabash Glee Club Director Richard Bowen invited Stark to guest conduct several numbers during the Homecoming Concert that Saturday. And Eric did savor the moment. A group of 60 amateur astronomers gathered at Wabash College Tuesday afternoon to view the transit of the planet Venus as it passed between the Earth and the Sun. Wabash College Professor Wally Novak helps a young astronomer view the transit of Venus on Tuesday. 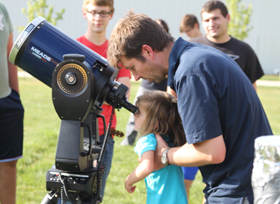 Novak and Professor James Brown set up telescopes on campus for viewers to enjoy the event. BKT Assistant Professor of Chemistry Wally Novak set up a standard telescope and a homemade pinhole camera to allow the members of the College faculty, staff, students, and their families watch the event as it took place. The next transit of Venus will not occur until 2117. Associate Professor of Physics James Brown brought a high-powered telescope with a solar filter so those who came could enjoy a clear view of the transit. People lined up and patiently waited for clouds to clear before eventually watching the event. Artist Matthew Davey will present “Shadow and Light” in the Eric Dean Gallery with an opening reception tonight. The reception runs 4:30 p.m. – 7 p.m..
See some of Davey’s work here.